Jayson Uribe goes from strength to strength, the Californian, one of the youngest ever competitors in the MotoAmerica Superbike category, backed up his superb qualifying performance with a double top ten finish aboard his Genuine Broaster Chicken Honda in only his third competitive ride on a 1000cc machine. 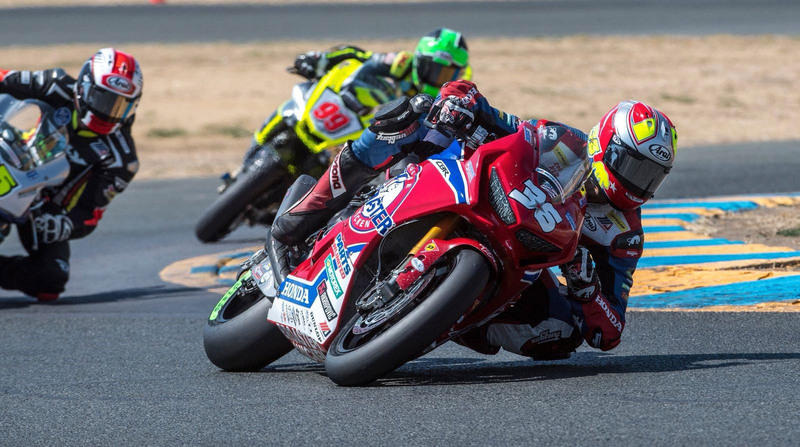 Jayson, who has scored points in all of his 2018 MotoAmerica race starts, ran a comfortable tenth in Saturday’s opening twenty two lap encounter around the 2.2 mile Sonoma Raceway, narrowly missing out on ninth at the flag. New parts ahead of Sunday morning warm up saw the #36 confident before a tech problem meant he would enter the race blind, unsure of how the bike would behave. Despite the uncertainty Jayson raced hard from the off, bringing his Fireblade home in tenth for the second consecutive race. As he has in all prior championships contested, including BSB and the ultra-competitive FIM CEV Moto2 European Championship, Jayson has shown natural speed and talent and whatever the future holds, it’s looking bright.